Of course everyone has been blogging about the atrociously-named ebook/blog reader, the Kindle – billed self-importantly by Amazon as a “revolutionary wireless reading device.” I’ve been putting it off out of sheer ennui, but like many others I believe it’s a step on the long and dreary march towards a usable portable electronic reader, which despite being way overdue is simply a matter of time. Kindle has so many flaws that I’m more interested to see how people hack it up than anything else – its choking DRM restrictions leave little room for anything but straight purchase downloads from the Amazon store, which is both limiting and short-sighted. That said, the ball is rolling to apparently make it a better product – a Seattle Times blog interview with the Kindle program director reveals that they anticipate future third-party development and are aware that device hacking is inevitable. if:book reports that, in an unsurprising move, Amazon stopped discounting paperbacks the same day they released the Kindle. Kindle. Kindle? 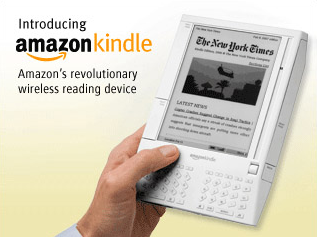 Why Kindle? I can’t get over the name, seriously. It’s awful. Why not simply make it do what people want in the first place? Among my complaints – it’s $400. It doesn’t read PDFs or other formats without a hack, only offers 256 MB of memory, and sadly gives no opportunity for open URL collaboration with library ejournal and ebook collections. And on and on. Someone is going to get this right someday. We’re getting one in the next few days to let some folks bang on it and see what can do, and more importantly, what we can do with it. I’ll follow up with more later, once we see it in action. I’m burning to know what y’all come up with – please keep me posted. There has to be a way libraries can leverage this thing, especially if people are going to keep buying it in large numbers. If it was a little more flexible, how great could it or some other electronic reader be for students – etextbooks, ereserves, web-based note taking and word processing, etc?